Looking for a fun activity that is self-checking, collaborative and is all about the holiday? This is a set of 15 problems that need to be cut apart, reassembled in the correct order and fastened together like a chain until the end is reached. 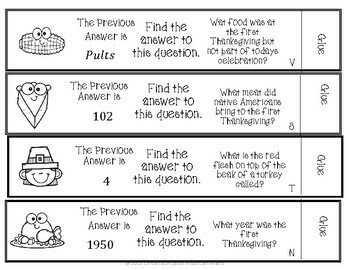 Each of the links has a question about Thanksgiving and the answer to another question. Students can either line up the strips in order before fastening together or attach as they go. 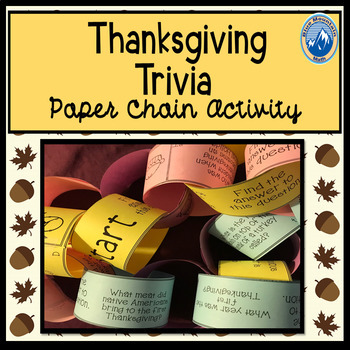 If you have not used a paper chain activity in your classroom, this is a great starter activity. My students know I love trivia and challenged me to make them a "fun activity" using trivia (and no math) :). Students begin with the link marked start and continue until they are out of links. If students are struggling, teacher can let students know which is the last link. 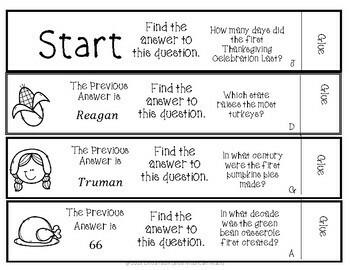 Each of the links also have a letter, teacher can quickly identify student progress by using the check word/phrase . At this time of year, I would like to add that I am grateful for all your support and I hope you have a blessed holiday season. 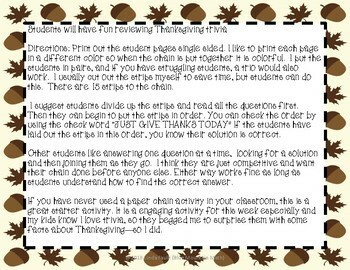 ✂3 pages of student "chains"
For more fun and engaging activities, click the "FOLLOW ME" above.